Spring and the new 2019 Operating Season is around the corner and Cheltenham has the daffodils to prove it! What the Eye Doesn’t See……! You will have read in the Blog about the Bridge Inspection work to be carried out along the line, and the tidying up that is going on at CRS in particular. There are some excellent pictures on the Facebook Group The Honeybourne Line – a GWR Mainline in the Making, of this weeks work in progress around the Evesham Road Bridge, along to Hunting Butts . P & O sporting 3 microphones for action recording. Apparently the recordings will be used by a well known model railway manufacturer to provide sound on their locos. The last week or so has seen the felling of ailing or precariously angled Corsican Pines along the railway. Today was CRS’s turn and there is an excellent blog post to follow the proceedings. The Diesel Gala Weekend is always very popular on the GWSR. See blog Posts. Here guest loco Onslaught has run round to pick up its train to Broadway. A thinly disguised Foremarke Hall runs around at Cheltenham Racecourse Station. One of the most unusual Steam Gala visitors for some time is the USATC S160 class 2-8-0 5197. Here it arrives with the 4:09 at Cheltenham. All it requires now is a blond wig and Gabby Hayes on the footplate. A brand new and unique event at the Gloucestershire Warwickshire Steam Railway. St George’s Day sees the start of the award winning British Asparagus Festival in the Vale of Evesham, and the Asparagus Express launched this year’s Festival! See Blog Post for all the details….. The first passenger train arrived yesterday at Broadway Station after 58 years of silence! A two day event had been set up by the GWSR Board to facilitate 4 trains per day, over 2 days, exclusively carrying all of the hard working volunteers on the Railway, on a round trip to see the new station at Broadway; and what a fine sight it was, a tribute the pains-taking efforts of those involved to build a close representation of what was there before. The Steam Gala team have announced that, subject contracts etc., 6023 King Edward II will be visiting the GWSR during the May Steam Gala. 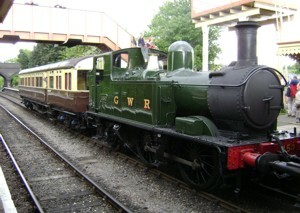 I’m sure all the GWR fanatics will be keeping their fingers crossed! A great photo supplied by the singing group Out (of the) Box, who sang for our Santa passengers on Saturday. They enjoyed their short visit to the station, entertaining during the loading and departure of train 2 and then for people alighting from train 1 on its return from Winchcombe. They earned some excellent plaudits from our volunteers and from the passengers. Gilly on the left is a regular performer at Gotherington during Wartime in the Cotswolds and the group have sung at Winchcombe for Santa’s in previous years. Nice to see Prairie 5526 back on duty for the Santa Specials. 5526 is on a break from South Devon Railway duties, and is one of the few million milers in steam. Having been away for the Summer, Dinmore Manor made a welcome return in time for the Race Specials. Diesel Weekend – I should Co-Co…. Lots of Diesel traffic arriving at Cheltenham Today (and tomorrow). Here 37215 arrives at Platform 1. With so much to see and do it will make your Day Out With Thomas the ideal all day family activity and, once you have bought your ticket for this event, entrance to all attractions is free! Ride not only with Thomas but also behind other steam and diesel engines, including Daisy, on the frequent trains between Cheltenham Race Course, Winchcombe and Toddington. Gates open at 0900 and trains will run every 45 minutes throughout the day with the first train at 0930 from Toddington and 0945 from Cheltenham Racecourse. Of course the Fat Controller will once again be over seeing proceedings and trying to make sure that Thomas doesn’t get into any mischief! Don’t forget to read the Autumn edition of the Cornishman! It’s full of well written articles and photographs about departmental activities and the many special events that have taken place during the summer. If you do not get a free copy with your membership then certainly beg, steal, borrow or preferably buy a copy – you will enjoy it! The Heritage Diesel Weekend will feature the GWR’s unique collection of ex-British Railways heritage diesel locomotives and multiple units, operating an intensive service of trains plus a guest locomotive. Nine locomotives will be in use (subject to availability) travelling just over 900 miles in the course of the 3 days. One of our locomotives undergoing extensive overhaul will form part of the exhibition inside the diesel shed at Toddington. English Electric class 37 locomotive D6948. A classic 1964 built diesel locomotive in immaculate condition and resplendent in the green livery of the era when diesel and steam shared Britain’s railways. The GWR’s 3 car class 117 DMU will be in use to provide a ‘fill in’ service between Winchcombe, Toddington and onwards up the new Broadway extension to Little Buckland enabling passengers to get a good view of the new extension works. All our locomotives and railcars are owned by preservation groups or individuals and most have their own websites packed full of information on the locomotive’s history, operation and latest news. Cheltenham Station was busy today with young Thomas enthusiasts eager to travel northwards to see their Favourite Engine. Here Bob and Andrew Stark act as meet and greeters. Bob is looking very dapper indeed! You will remember an item on the blog, reporting the sad passing of Fred Lea the GWSR Railway Artist. Fred died of liver disease and his son Colin is setting out today on a coast to coast walk to raise funds for liver disease research. Colin is recording his progress on a Blog and I would encourage you to follow his progress and thereby show moral support. Such an achievement by the GWSR Volunteers concerned! Over the weekends of 3rd / 4th June and 10th / 11th June the GWSR will be replacing the normal diesel railcar service on the red timetable with a steam-worked autotrain using locomotive No. 1450 and auto-coach No. W238, named ‘Chaffinch’. These push-pull trains were the backbone of the stopping passenger services on the Honeybourne Line for many years. CRCS Platform 2 gets a tidy up! The container at the end of platform 2, used by the Broadway Building Team for storage and a rest room, has now been removed, the vacated area tidied up, and the bank re- profiled. See also the blog entry for today. Tornado hits the 100mph with ease! And with a Smiths Speedo – brilliant! I was asked to blog this quite rare picture of the first day of the 1955 Festival Meeting that was “snowed”off. Its quite a unique picture in as much as there are few photos of passenger trains stopped on Platform 2. It does beg the question as to what these apparently happy punters did for the rest of the day! 35006 P&O sizzles in the morning sunshine on Tuesday, about to return northwards with the first of the ever popular race trains. Foremarke Hall heads Dinmore Manor as they run round the lunchtime train of the day. How quickly it comes around! A sunny morning sees the first steam hauled train arrive . Come along and enjoy your local Heritage Steam Railway. A scheduled main line service of a traditional locomotive has taken place on Britain’s railways for the first time in half a century. The Peppercorn class A1 steam locomotive, Tornado, passed over the “Roof of England” on the famous Settle to Carlisle line on Tuesday, carrying hundreds of steam enthusiasts. Leaving from Appleby at 8.25am, the train made its way through the rugged Eden Valley in Cumbria, across the Ribblehead Viaduct, and over the Yorkshire Dales. A milestone was reached last week when the highest number of hits recorded in a week took the total Blog Views over 100,000. Thank you to all the Blog Followers and in particular to the Cheltenham Volunteers who turn up, fair wind or foul and gives us the material to report! A BIG thank you to all who voted for the GWSR in the #AvivaCommunityFund, we have been awarded the £25,000 to fit out the new Winchcombe building. I was so very sorry to hear of the recent passing of Fred Lea, one of the great railway artists. He was a member of the Guild of Railway Artists. 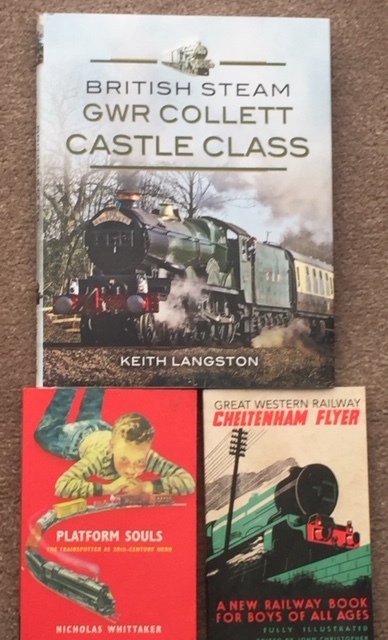 Apart from his talent as an artist, he was such a pleasant and friendly chap, and always willing to apply his skills to promote the Gloucestershire Warwickshire Railway. He will be very much missed and my sincere condolences go to his family and friends. A Merry Christmas and Happy New Year to all the GWSR Volunteers and to all of our generous supporters who make it all possible. The commemorative stone in place at Broadway Station. Fantastic! 4270 was looking great and sounding in fine fettle as it coupled up to the northbound Santa Special. It was good to see the number of visitors to the blog exceed the 80,000 mark. Thank you! Friday 14th October 2016 and Platform 2 at Cheltenham Racecourse receives its Tarmac Surface! Thursday 29th September 2016 – The Container Arrives! Groundwork preparations have been under way for some time in anticipation of the delivery of a 20ft ISO Container for storing CAG materials and equipment. Today was the day! See blog report. Our thanks go to the container supplier – Lion Containers and their nominated transport company David Watson Transport. Around 30 French Traveller caravans have moved in adjacent to the GWSR Station Car Park. Many congratulations to Roger Gould and Alan Wilsdon who received their 15 Years Service Certificates at Cheltenham Racecourse Station today from Dave Griffin, Senior Stationmaster at CRCS. A surprisingly good series of 3 episodes describing the impact of the Railways in Britain over the past 200 years. Catch up with it here – you won’t be disappointed! A Great time to visit the Gloucestershire Warwickshire Railway. Always a firm favourite with children and grown ups alike, preparations were proceeding this morning to decorate Cheltenham Racecourse Station in anticipation of the weekends entertainment. Dave Griffin, Senior Station Master at Cheltenham Racecourse Station hangs the advertising posters. Before the railway age the journey from Birmingham to Bristol by canal took one week, while that journey by road could take up to four days. It is no wonder that people were delighted when the railways arrived, as so much time was saved and the journeys were so much more comfortable; the degree of comfort depending upon which ticket you bought, as there were 1st, 2nd and 3rd Class seats………. Please continue with your support! Steam traction is always fascinating. Note the mandatory garb! Railway enthusiasts from all corners of the enthusiast spectrum, cannot have failed to enjoy this years Cotswold Festival of Steam. Pristine locos put through their paces on a busy schedule, full of interest and nostalgia. Well done GWSR! 35006 Peninsular & Oriental S N Co arrives with a full a Load – See posts for todayIt’s difficult to put into words what blood, sweat, tears (and joy) must have gone into the rebuilding of 35006 and bringing it back to its former glory. As a steam enthusiast all my life, it was an absolute pleasure to be at Cheltenham to see it back in steam today. Brilliant! What a Magnificent Sight and what an Achievement! Dinmore Manor passes through Bishops Cleeve with the last train of the day on Wednesday 27th April. This is a popular event in the GWSR calendar and is always well supported. I am sure this year will be no exception. Would-be thespians and alter egos descend, safe in the knowledge that no bombs will be falling! Whilst in years gone by duties at Broadway prevented your Editor attending, this year best laid plans were thwarted by personal circumstances – nevertheless there are more exciting events on the horizon! A thank you goes to Bob and Ros Stark who have taken time out to photograph and describe the proceedings through the blog. Broadway Station gets its footbridge – see Disconnected jottings….. The wild primroses saved from the bulldozers at Broadway are now in full bloom. These are a feature on the cuttings and embankments all along the Honeybourne Line. Following Bob Starks request for plants, Broadway volunteer Vic Smith has kindly offered to bring some specimens down to Cheltenham for planting on the the platform 2 cutting slope. CAG Member Tim Winstanley kindly took time out write a Blog Post report on a GWSR “1 hour General Risk Assessment briefing” that he attended with two of his CAG colleagues yesterday. The content represents Tim’s “take” on the briefing, but probably represents the pragmatic view that most volunteers would share. 20,000 hits since the beginning of March 2016 – that will do nicely – thank you! If you have travelled the GWR (Great Western Railway) extensively or indeed are well read on GWR buildings and structures you will have realised what a now near unique building the CRC Ticket Office is. Have a look at a new item by Bob Stark under Disconnected Jottings which gives an insight into its roof construction method. To all Blog followers – If you have some digital photos of Cheltenham Racecourse Station that you would like to share with us – ancient or modern – please get in touch through the Contact link above and I will create a gallery (crediting the source). Locos would be great, but people enjoying themselves will do nicely! A Bone to pick…. See post for the 23rd March – answers on a “post” card…. On the 10th March 2016 Ben Amor and Declan Flannery from Gloucestershire University interview Bob Stark in the Station Booking Hall. Here are the edited highlights. See the Post for the day…. Reading the latest Woodmancote News, I came across an interesting article – “The Memoirs of a Trainspotter” by Nick Ebdon (Nick is the editor of the WN). I made some enquiries with Nick and a very ‘It’s a small world’ email exchange ensued. The upshot was that Nick agreed to my including his article for a wider audience to read, which I have done in the Disconnected Jotting link above. He kindly included some of his background which involved an association with the GWSR, sitting on the Board with Tim Bazeley as Chairman. I am sure, like me, you will be able to relate to the enthusiasm that comes over in Nicks Trainspotter story and further, I hope it might encourage you to share your stories in the Disconnected Jottings. Please get in touch if you have a Railway story to tell. 10th March 2016 – Ben Amor and Declan Flannery from Gloucestershire University interview Bob Stark in the Station Booking Hall. In between times the Diesel Railcar looked after the interim runs. Here approaching the Station with Station Master Dave Griffin very much in charge. There is much see and do and the Cheltenham Area Group looks forward to your visit to the Railway.